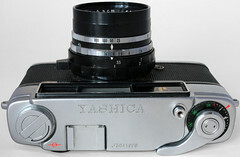 The Yashica J is a 1961 rangefinder camera. It has a high quality lens and a rather limited set of shutter speeds. 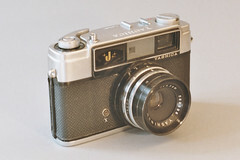 At the time of release, it was probably considered a budget model, since the better equipped Yashica Lynx 1000 and Yashica Minister series were being marketed at approximately the same time. 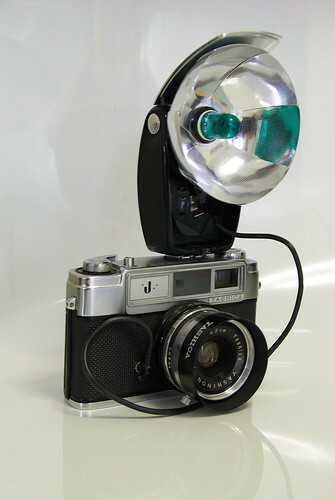 Confusingly, the Yashica Penta J SLR and its successors are often referred to as the Yashica J line. Two sets of framelines are visible in the viewfinder, one set for infinity focus and the other one for closer focus. There's no automatic parallax correction as on the later Yashica Electro 35 series. 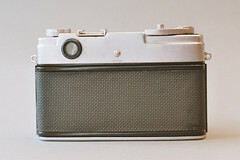 The rangefinder is coupled to the focusing ring. This ring has a small lever to make focusing more comfortable. The lens is a fixed 45mm F/2.8 Yashinon with apertures from 2.8 to 16. The minimal focusing distance is 1 meter. There a framecounter around the advance lever, counting up from 1 to 36. On the back a small screw permits adjustment of the rangefinder without opening the body. 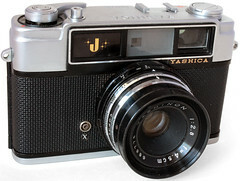 The Yashica J has a rewind crank which will not open the back door; opening the camera is achieved by moving and depressing a small button on the bottom plate. 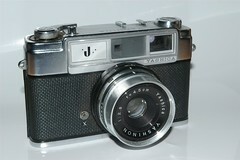 At least two variants of this camera are known: one with the *J** logo on a black field and with a black lens barrel, and another with a metal colored field and lens barrel. The Yashica 35W is virtually identical to the J but with plainer styling on the top plate, a brushed metal focus ring and no strap lugs. This page was last edited on 18 May 2017, at 05:24.